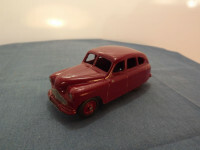 This model is the Dinky 40e-G-1s Standard Vanguard in Maroon. 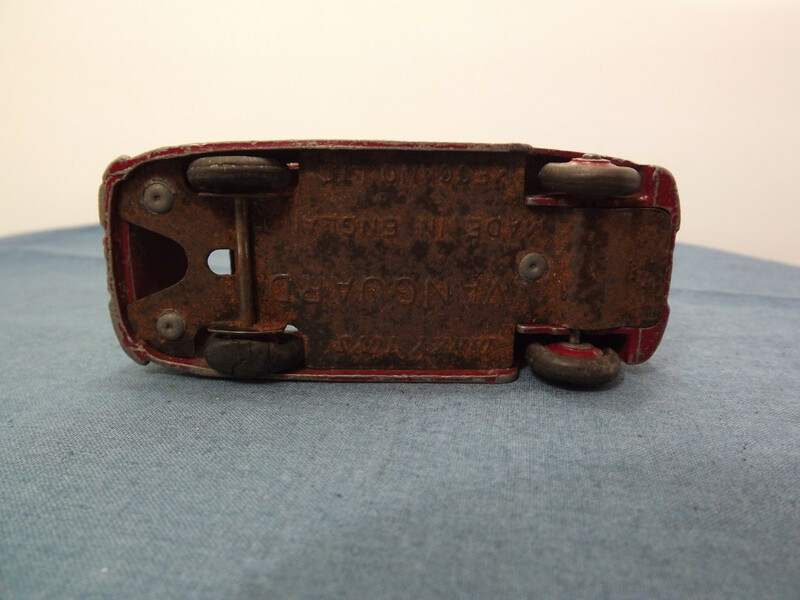 This item is a genuine item probably created due to Meccano's close relationship with the Standard-Triumph company (in a similar situation to the Triumph 40b in black). 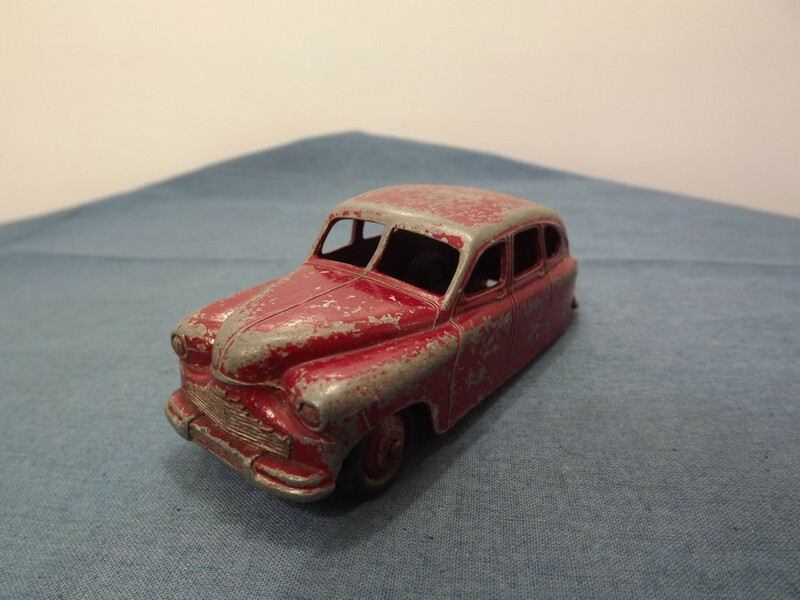 It is considered a very rare version of the model and current items on eBay are listed at £1,600.00 plus. I have designated it 40e-G-1s as it was a special release and is not recorded in most of the major references. This model features a single piece cast body with all detail cast into the body casting. 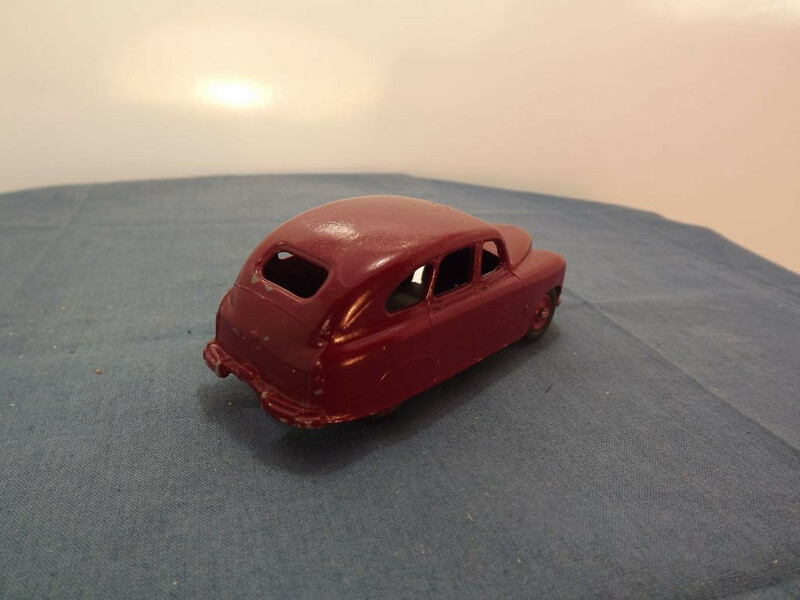 The entire body is painted maroon with the grille and headlight lenses left unpainted. There is no interior or glazing. The base plate is black painted tinplate metal. 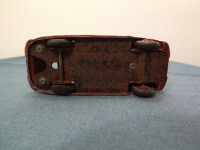 It is marked with "Dinky Toys" at the top centre, "Vanguard" (in large lettering) in the middle centre, "Made in England, Meccano Ltd" at the bottom centre. 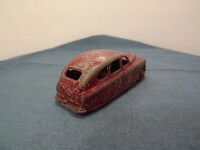 The model number does not appear on the base. It is held in place by three machined rivets. All wheels have black rubber tyres with maroon hubs, fitted to steel axles. The hubs are of the original cast, ridged variety. The model can also be found with tan hubs. This model was issued circa 1950 to 1954. This model is the Dinky 40e-G-3 Standard Vanguard in Maroon. This item is a Code 3 item that has been repainted to represent the very rare version of the model. The baseplate is black painted tinplate metal. 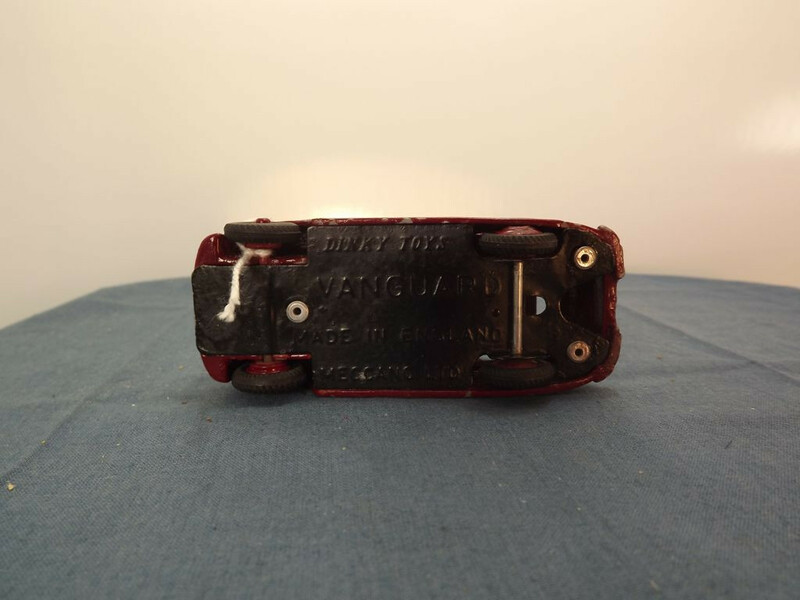 It is marked with "Dinky Toys" at the top centre, "Vanguard" in the middle centre, "Made in England, Meccano Ltd" at the bottom centre. The model number does not appear on the base. It is held in place by three aluminium rivets. All wheels have black rubber tyres with maroon hubs. 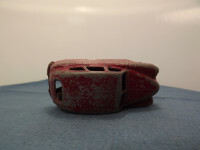 The rear wheel hubs are of the original cast, ridged variety and are painted maroon. The front hubs have come from a different model and appear to be spun metal, over-painted maroon. This model was created circa 2010.